Roasted Mushroom & Kale Pilaf. | Eat More Plants. 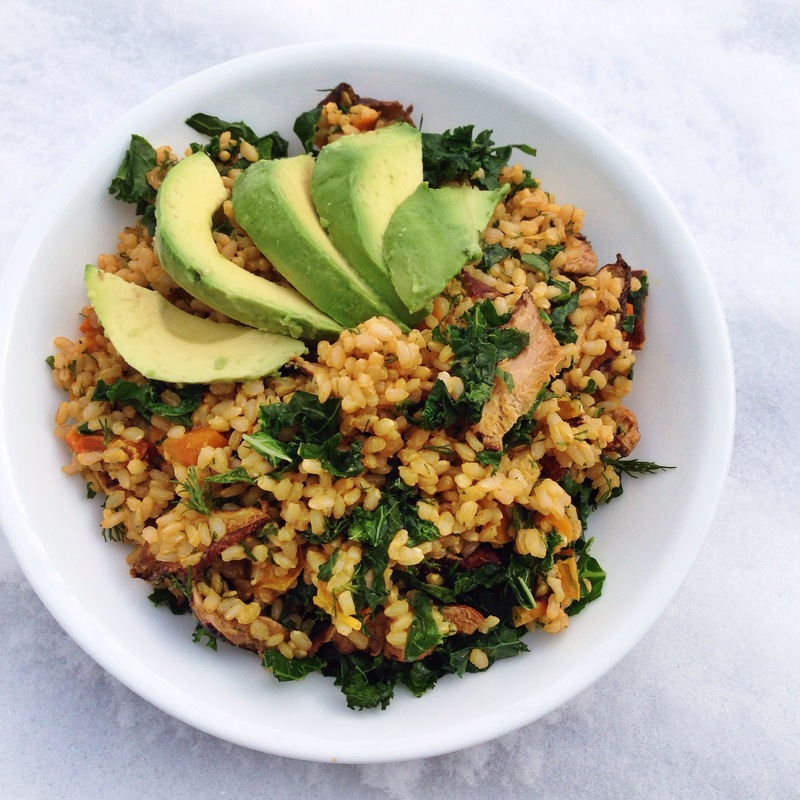 Roasted Mushroom & Kale Pilaf. I’m all for making meals that make excellent leftovers. I love to make a big dinner and have it for lunch the next day too. This mushroom and rice salad is really tasty the next day, even cold out of the fridge. I most often use shiitake mushrooms, even though they are on the expensive side, because they have great health benefits as well as really great earthy flavor. Sometimes I’ll roast a few trays of them at a time and save them for adding to dishes throughout the week. They reheat well, especially if you want to add them to pasta and warm them up in some tomato sauce. Shiitakes contain a compound called “lentinan” which is said to strengthen your immune system and help you ward of disease and infection. Lentinan is also a cancer fighting compound. Shiitakes are a good source of iron! Iron improves the ability of your body to circulate oxygen through your blood. First, get your rice cooking. Bring the 1 1/3 cups of vegetable broth and rice to a gentle boil, stir for 30 seconds while turning the heat down to low, cover and set the timer for 25 minutes. Make sure your heat is as low as possible. While the rice is cooking, chop the mushrooms. I chop them into 1 inch thick strips. Toss the mushrooms in the olive oil and garlic powder. Lay the mushrooms out on 1 or 2 sheet pans and roast them for ~15-20 minutes. They will shrink up in size and begin to crisp up on the edges when done. When the mushrooms are done, turn the heat down to 300 degrees F, put the finely chopped kale onto a sheet pan and bake that for about 10 minutes, or until wilted and softened. When your rice timer goes off, uncover, fluff it and check that most of the water has been absorbed. Take a small taste to check that it’s been cooked through and let it sit, covered, for another 5-10 minutes. Add your cooked rice, cooked kale & mushrooms, soy sauce, nutritional yeast, dill, lemon and any of the optional extras to a big bowl and mix thoroughly. If you can’t find nutritional yeast, add a little extra soy sauce for more flavor. 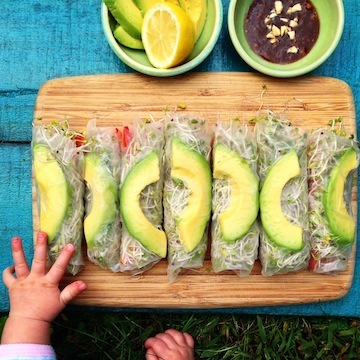 *If you’re going to save some of this for leftovers, don’t add the avocado to it. It will get brown and yuck by the time you’re ready to eat it the next day. While my mushrooms were roasting, I put a whole yellow bell pepper into the oven as well. I left it in for about 30 minutes until it was completely softened and charred all over. By doing this, you can easily peel the charred skin off (once the pepper has cooled) and you are left with the deliciously smoky flavored flesh! Raw Pear & Walnut Crumble. Oh yay!! I love the roasted peppers too 🙂 Glad you enjoyed it!